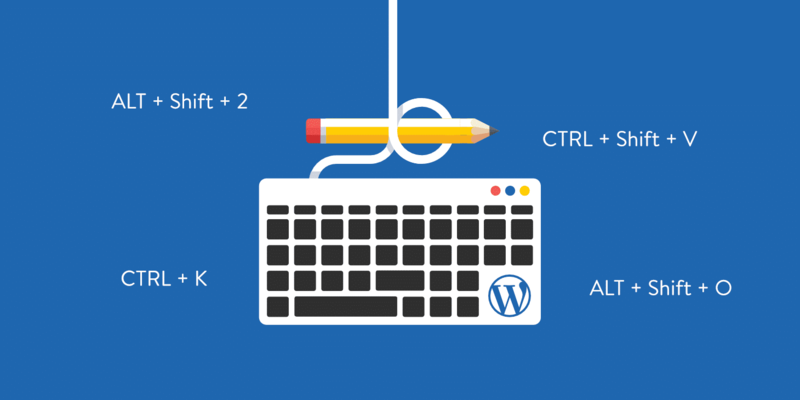 WordPress 5.1 is the first major release since the launch of the WordPress block editor (AKA Gutenberg) in WordPress 5.0. And while it does bring some tweaks and improvements for the block editor, the biggest new features in this release involve the WordPress Site Health project and notices for PHP versions. 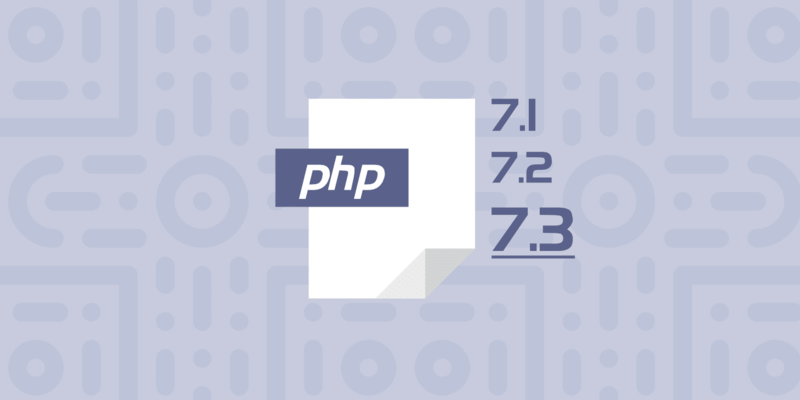 First up, if you’re running an outdated version of PHP on your server with WordPress 5.1, you’ll see a new dashboard widget prompting you to upgrade your PHP version. If you host at Kinsta, there’s zero chance you will see this message because the minimum PHP version that we allow is PHP 5.6. Right now, the warning will only trigger for PHP versions under that. Beyond the soft prompt in the WordPress dashboard, WordPress 5.1 also adds forced PHP compatibility checks when you go to install a new plugin or theme. This is awesome for developers! For a while, WordPress plugins developers have been able to set a minimum PHP version required as a comment in the plugin header. However, up until now, this hasn’t done anything but show what minimum PHP version the developer is willing to support. Additionally, you will be prevented from installing the plugin. At this time, you can get around this by manually downloading the ZIP file from the repository and installing a plugin that way. But really – just update your PHP version! 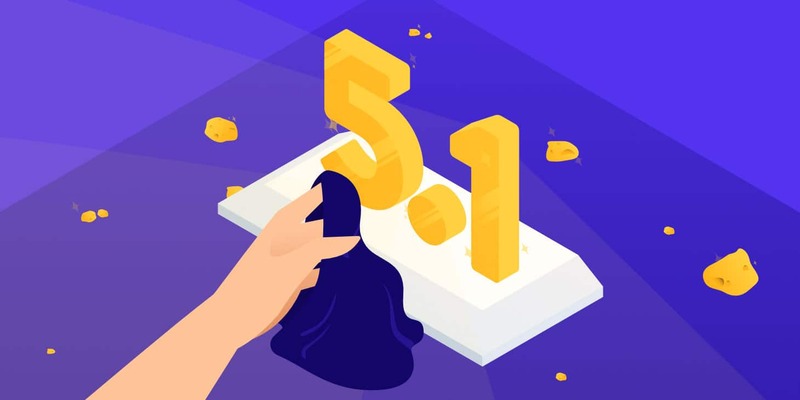 WordPress 5.1 was scheduled to introduce a new feature called “fatal error protection” which would protect from the WordPress white screen of death while updating PHP. Unfortunately, this feature was been pulled from the WordPress 5.1 release at the last minute. However, it’s for good reason. The fatal error protection mechanism explained here has been pulled out of the 5.1 release as it had several flaws critical enough to postpone the feature. A new path to address the issues is underway via #46130 and is intended to be released as part of WordPress 5.2. 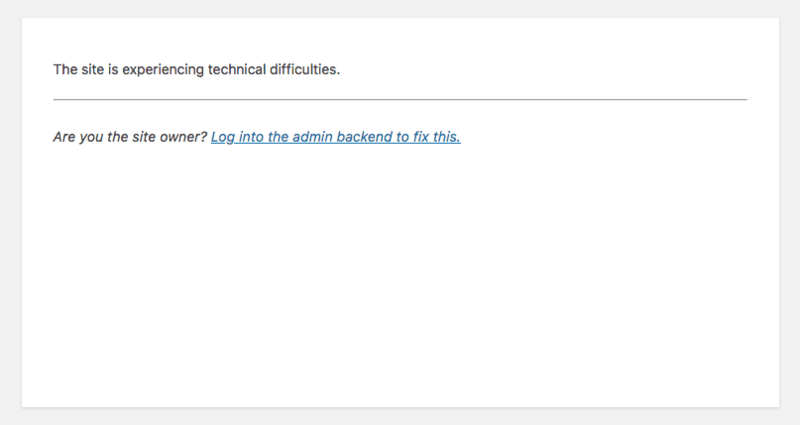 With this protection, WordPress will recognize when a fatal error occurs and pause the offending theme or plugin in the WordPress admin dashboard so that you’ll still be able to log into the backend of your site and (hopefully) fix the problem. For less tech-savvy users, this will be a great new feature once they iron out all the problems. If your site experiences issues while upgrading PHP versions, it will look like below on the front-end, but you should still be able to log into the backend to fix the problem. Since the initial release of the Gutenberg block editor in WordPress 5.0, the Gutenberg team has been hard at work improving the block editor. If you remember from our annual PHP benchmarks, we found that WordPress 5.0 and 5.02 were actually slower than WordPress 4.9.8. That’s not good! Best rest assured, the WordPress core team is working on this. 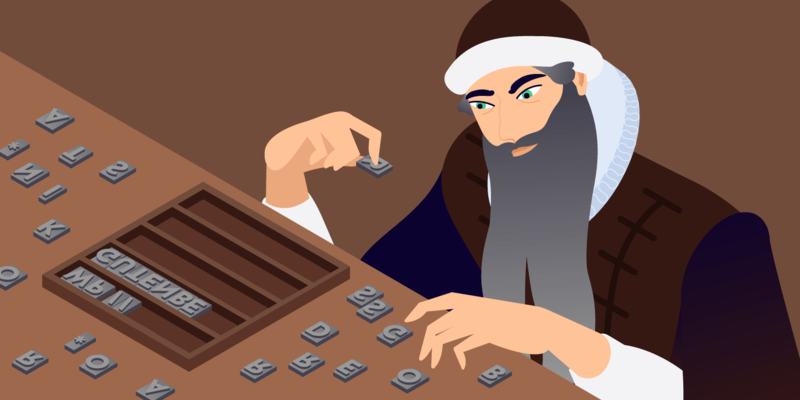 There was a bit of confusion as the Gutenberg team released Gutenberg 5.1 at the same time as the core team released WordPress 5.1. Despite the identical version numbers, WordPress 5.1 does not include Gutenberg 5.1. Instead, WordPress 5.1 includes Gutenberg 4.8. As such, the biggest changes to the block editor in WordPress 5.1 deal with performance. 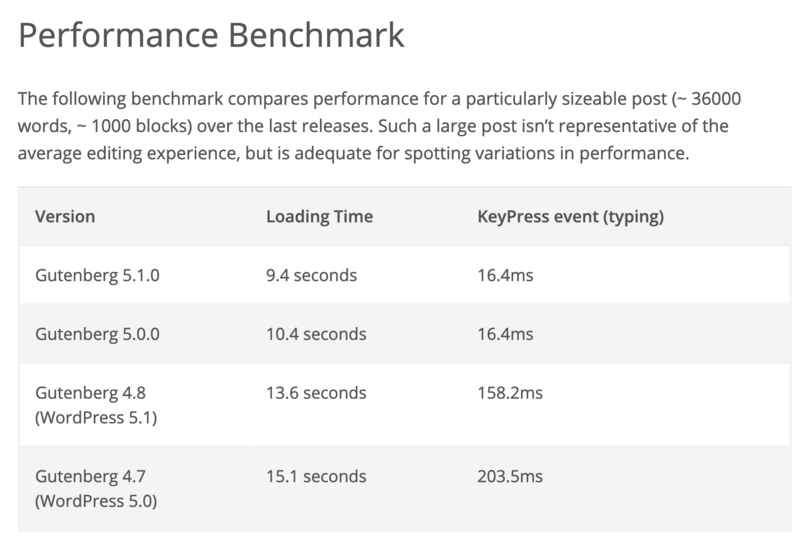 Compared to WordPress 5.0, you should see faster load times in the editor and a shorter KeyPress event time. There’s more good news, too. The block editor performance will get even better once the most recent versions of Gutenberg are merged into the core – you can see a performance comparison of different Gutenberg versions below (remember – WordPress 5.1 includes Gutenberg 4.8 – so that’s where we’re at right now). Beyond the new user-facing features above, WordPress 5.1 also packs some new features for WordPress developers. WordPress 5.1 adds a new database table to store metadata associated with sites. Learn more. The Cron API now has new functions to help with returning data. You’ll also get new filters to modify cron storage. Learn more. Since every customer’s site is different we always recommend utilizing the one-click staging environment. You can clone your live site in a matter of seconds and then test WordPress 5.1 with your existing theme and plugins to check for compatibility. You can of course also take a manual backup before updating your live site, just to be safe. 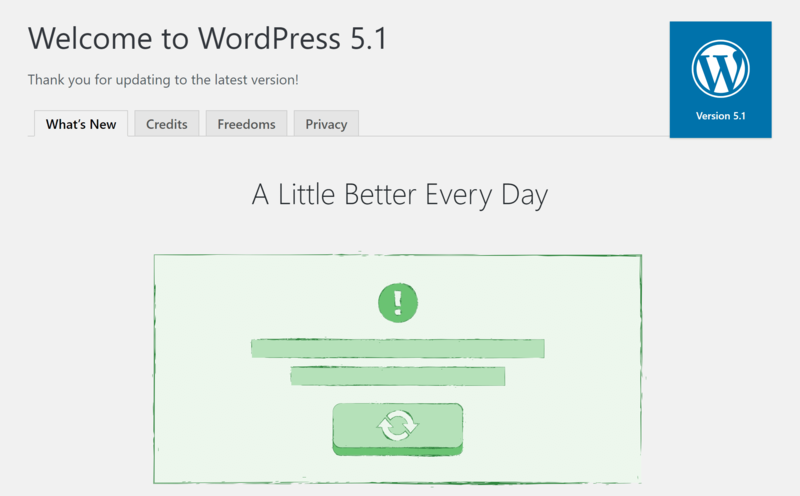 To update WordPress to 5.1 simply click on the updates icon in your WordPress admin dashboard. And click on the “Update Now” button. While your site is being updated, it will be in maintenance mode. As soon as your updates are complete, your site will return to normal. After clicking around in the dashboard you will also receive a message to update your database to the newest version. Simply click on the “Update WordPress Database” button and you’re good to go. Try switching over to a default WordPress theme, such as Twenty Nineteen. If this fixes your problem, you might want to reach out to your theme developer. While there aren’t any big front-facing features in this release, WordPress 5.1 adds some great features to push for healthier WordPress sites. The focus on PHP versions will hopefully push the large percentage of WordPress users running out-of-date PHP versions to update to more recent versions, and the block editor performance improvements are much welcomed. What do you think of WordPress 5.1? Does anything catch your eye? Anything you wish they would’ve included? 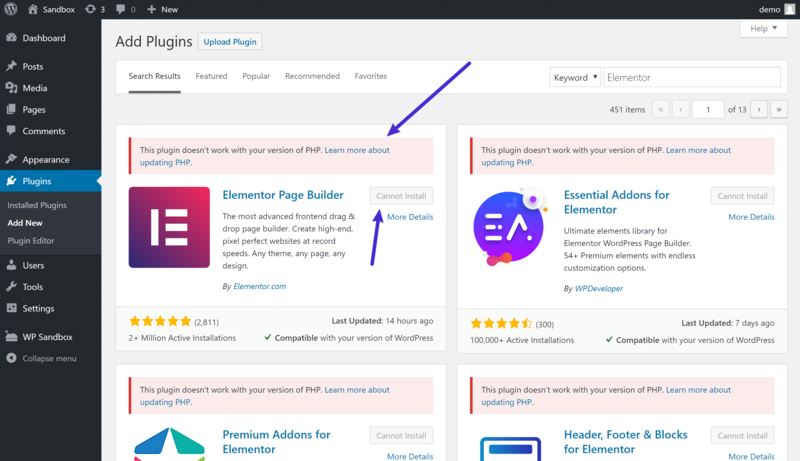 Great article, unfortunately the new WP editor (Gutenberg) messes a lot with all popular plugins like Yoast and we have to stick with Classic editor plugin for most of the time. Great Article! I have been using this version of WordPress 5.1 and really find amazing. But thank you for giving the internal/technical information about the same.